Every Tuesday, Liz Conner travels from her small apartment in the Brooklyn neighborhood of Brownsville, one of New York City’s poorest areas, to Manhattan’s Upper West Side, one of its wealthiest. The trip takes a walk, a bus ride, two subway trains and finally another walk. On a good day, it takes her “an hour and some change,” she said. Her destination: A Taste of Heaven, the weekly 4 p.m. Tuesday service at West End Collegiate Church. To Conner, every aspect of her trip, from start to finish, is noteworthy. She has a home, after living for years on the streets. 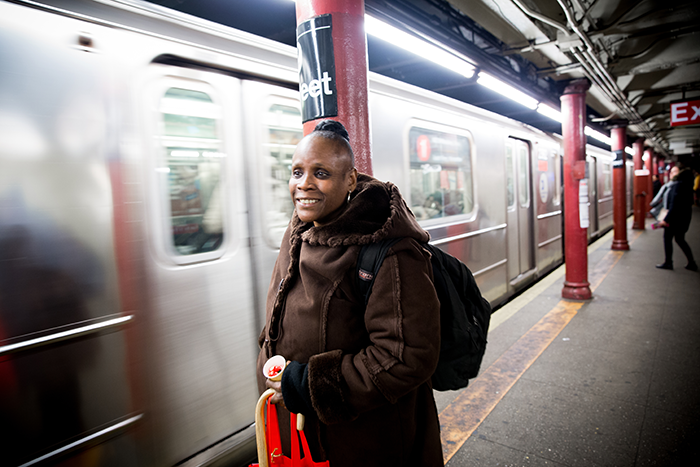 She navigates the city with ease, demonstrating both literally and figuratively how far she has come, how much she has accomplished -- including recovery from crack addiction. Liz Conner waits for the subway, one of two she takes to get from Brooklyn to the Upper West Side. And at the end of her journey, Conner finds community she never thought she would have. Born on St. Thomas, in the U.S. Virgin Islands, she came to New York at 14 and is now estranged from most of her relatives. The congregation at A Taste of Heaven is her family, she said. On a blustery winter Tuesday, just after the church doors opened, Conner settled into a chair at the front of West End’s chapel. In an unusual arrangement for a worship service, the chairs were set around large tables throughout the room. But then, A Taste of Heaven is an unusual worship service, one that began as a soup kitchen ministry. Unlike West End’s Sunday morning worshippers, many who attend A Taste of Heaven have no fixed address. Some regulars carry all their possessions with them, in bags and rolling suitcases. Many struggle with social anxiety, mental illness or physical ailments -- or all three. Worship begins as Kast circles through the room with the Christ candle. For pastors and other church leaders, A Taste of Heaven offers a model of how to be in ministry with rather than to a community. To the Rev. Michael Bos, the senior minister at West End, the service and dinner afterward shows what “outreach” can become when the church listens to the people it is trying to reach. Who is your church trying to reach, and how well does it listen to them? Is your church in ministry “with” or “to”? 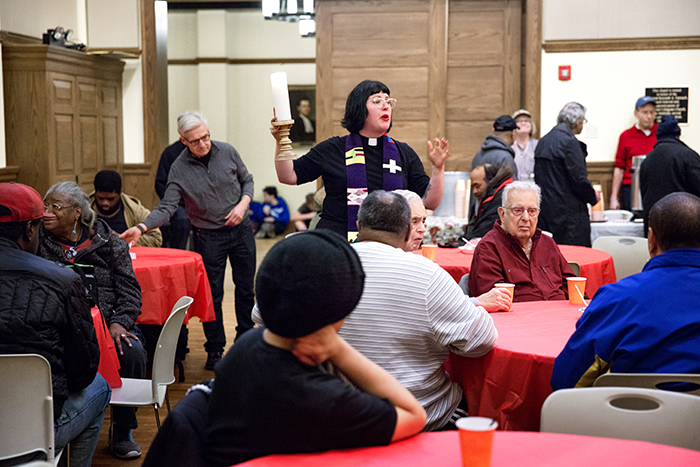 The shift from a typical urban-church outreach program into a full-fledged worship service for people who are marginalized and in need was both an evolution and a revolution, largely orchestrated by the Rev. Jes Kast, the associate minister at West End. In the early 1980s, West End, a congregation of the 390-year-old Collegiate Church of New York, affiliated with both the Reformed Church in America and the United Church of Christ, began serving dinner every Tuesday evening to anyone who wanted a meal. Eventually, an optional pre-dinner Bible study was added -- typical fare for a church-run soup kitchen. After Kast arrived in 2011, however, the dinner and Bible study began to change more dramatically, with input and direction from the participants. Under Kast’s leadership, the Bible study evolved into an innovative worship service, with its own liturgy featuring candle lighting, prayer and a sermon. And the dinner became more like a celebratory banquet than a typical soup kitchen meal, with entertainment provided by some of New York’s finest musicians. A new spirit of belonging grew. What had been a weekly meal and Bible study became its own congregation. Kast asks worshippers to call out their prayer requests. West End Collegiate Church, established in 1892 as brownstones and apartment buildings were replacing the fields, estates and villages of the Upper West Side, has long been a place of outreach and welcome. During World War II, for example, the church was a center of refugee-relief efforts. It was in keeping with that tradition that the church launched the Tuesday soup kitchen. How does your church’s history shape its ministry today? Is it a help or a hindrance to ministry? When Kast started at West End, straight out of Michigan’s Western Theological Seminary, the church was undergoing renovations. Because the fellowship hall was a construction site, the soup kitchen was serving meals in the main sanctuary. Every week, the diners ate under the gaze of Jesus, as depicted in a Tiffany stained-glass window. What reasons would people cite for not attending your church? Unable to stop thinking about the comments, Kast realized that an outreach ministry has to focus on more than people’s physical needs; it must address their spiritual lives as well. She began to reimagine “belonging” and “feeding” in the context of the Tuesday gathering. What does “belonging” and “feeding” look like at your church? Who gets to belong? Who is fed and in what ways? Even now, the ministry’s rhythms are dynamic. The demands of congregants’ daily lives dictate the gathering’s monthly ebbs and flows. Attendance tends to be lowest early in the month, after disability and Social Security checks arrive, and rises as money runs out. But every week, the worship structure remains stable. The rituals begin at the door, where the Rev. Howard Major III, West End’s assistant minister, welcomes worshippers. James Royal, left, is greeted at the door by the Rev. Howard Major III, assistant minister at West End Collegiate. On the recent Tuesday, after most of the congregation had grabbed a seat and a cup of tea or coffee, Kast launched into a call-and-response liturgy. Casual but carefully structured, it was designed to maintain attention and encourage interaction. “I like that word, ‘forgiveness,’” a woman in a New York Rangers sweatshirt said loudly. Shifting into a time of prayer, Kast invited everyone to voice requests. One man asked for prayer “for hope.” Many cited world events -- the Texas church massacre, the devastating earthquake on the Iran-Iraq border, the hurricanes that hit Puerto Rico and the Virgin Islands. Then the praise came. People thanked God for life, for coffee, for each other, for fathers and mothers, for health, for things great and mundane, all accompanied by applause and amens. After a pastoral prayer, Liz Conner rose to read Psalm 84: “How lovely is your dwelling place, O Lord of hosts! …” Then Kast preached a brief sermon on God-given sanctuary, crafted for those who might struggle with the concept of home. “Go in peace and know that you are dwelling in a lovely place,” Kast said, arms outstretched. Kast then dismissed the gathering to a dinner of tuna casserole, peas and carrots, bread, and fruit. Soon, others who hadn’t attended the service joined the communal meal. With the shift from worship to dinner, the soundtrack changed too, from recorded gospel to live jazz. 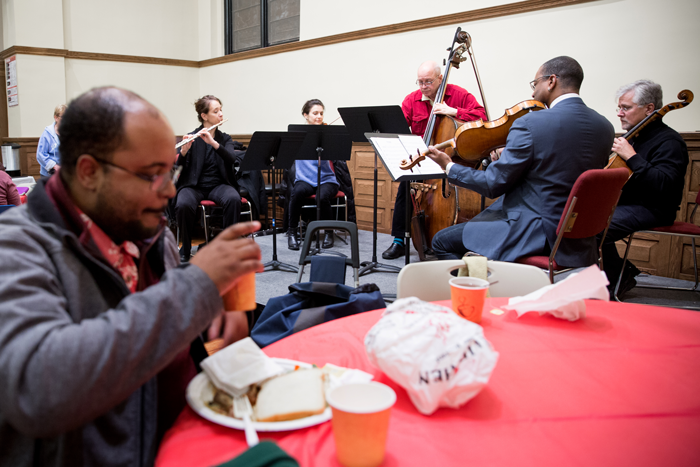 Led by professional bassist Bill Ellison, a jazz group typically plays monthly for the dinner -- though in December Ellison for the first time led a classical ensemble. Earlier this year, Ellison, who attends West End’s Sunday morning services, asked Kast if she might like to have professional musicians perform for the gathering. Bassist Bill Ellison leads a classical ensemble in December 2017, a change from the usual jazz band. Ellison has had little trouble recruiting talent; the evening’s band included musicians who have played in pit orchestras for “Rent,” “Mamma Mia!” and “Cabaret” on Broadway. The Taste of Heaven gig pays no cash but offers immeasurable benefits far beyond, say, fancy New York fundraisers. Ellison’s goal is to bring joy to people at A Taste of Heaven, but with Kast’s help, he has also found unexpected, deeper meaning in the performances. Recently, Kast pulled Ellison aside to thank him, saying that his ministry was important. What are your best gifts and talents? How can they be used in ministry to others? The Tuesday worshippers span a wide range of society: black, white, Asian, Hispanic/Latino; young and old; employed, jobless and retired. Eartha Corbin, 82, a retired MetLife payroll analyst, has attended regularly for two years. Although A Taste of Heaven is different from the Baptist church she attends on Sundays, the gathering’s diverse community has expanded her view of humanity. Once, she might have been reluctant to share space with people who live on the streets. Craig Petti, 45, moved from Connecticut to New York last spring after losing his engineering job and then his home. He has no interest in finding another job and no intention of claiming government assistance. Most nights, he said, he sleeps on the steps of churches in Midtown Manhattan, preferably those with overhangs to protect him from inclement weather. Since finding A Taste of Heaven last summer, it’s become his “Tuesday spot,” he said. The Tuesday service’s growth has created new challenges. While some Sunday worshippers volunteer at the service and a handful of Tuesday worshippers attend West End’s Sunday morning service, the church essentially has two congregations now. The 11 a.m. Sunday service draws about 150 people, while the Tuesday Taste of Heaven service typically draws 60 to 100, and more than 150 for the meal afterward. Kast offers a benediction, “Go in peace and know that you are dwelling in a lovely place." “Part of my work now is to bridge that gap with some holy boundary crossing,” Kast said. What gaps does your church need to bridge, both internally and externally? What “holy boundary crossing” does it need to do? Much of that work happens at the Tuesday gathering, where she tries to listen deeply to both God’s word and the worshippers’ voices. “How often are their voices heard?” she said. Leaders have emerged organically in the Tuesday community, and Kast wants West End to add an elder or deacon from their ranks. Such a move would help deepen the church’s integration and underscore that the Tuesday worship is not secondary. The Tuesday congregants have been instrumental in expanding the church’s ministry and sense of possibility. 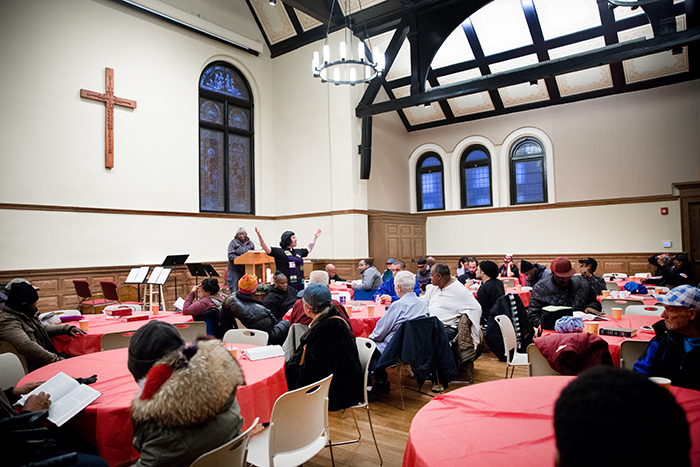 Last year, on the initiative of a regular named Precious, A Taste of Heaven added a free-writing and open-mic time after dinner once a month. The congregants often express themselves with a candor that is bracing. 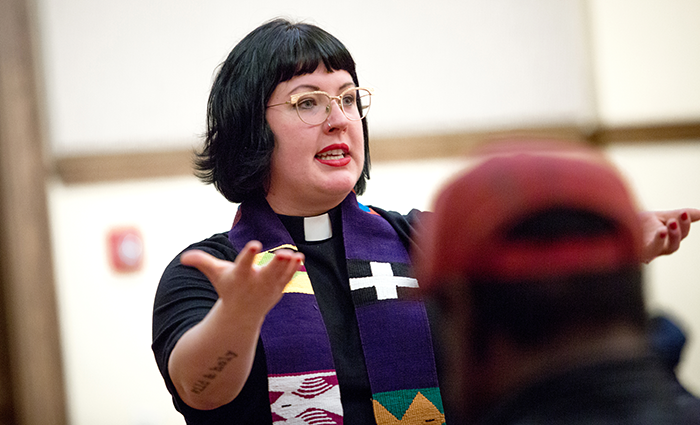 Last year, Kast solicited new names for the gathering that, for years, had been called “Supper Center.” People submitted a variety of names that were theologically sound and reflected a deep understanding of the service, she said. “The idea was that those whom the world has rejected, Jesus has accepted,” Kast said. It was turned down as prone to misinterpretation, and ultimately, “A Taste of Heaven” prevailed. The name’s creator: Liz Conner. Turns out, she’s a wordsmith. Her crack addiction may have claimed her previous home and her family ties, but she never stopped writing poetry. Now, she transcribes her poems in neat calligraphy onto plywood panels -- usually heart-shaped, sometimes round -- which she shellacs and sells for $10 each. Our life is like an empty loom, an unknown pattern in the womb. We need His help. He takes our hand, and leads us through the shifting sand. Who, if anyone, is your church trying to reach, and how well does it listen to them? Is your church in ministry “with” or “to”? How does your church’s history shape its ministry today? Is that history a help or a hindrance to ministry?